We headed back downhill from the 3-Ax ski area to Ax-les-Thermes and parked in the same daytime parking spot as we did a couple of days ago. Here we wander around the town and manage to take in more than we did the first time round. It’s a pretty little town once you head away from the main road. We explore a few shops and pick up bread products for the next couple of days, steering clear of anything that’s too artisanal for Paul to chew (he does like a white fluffy bread). 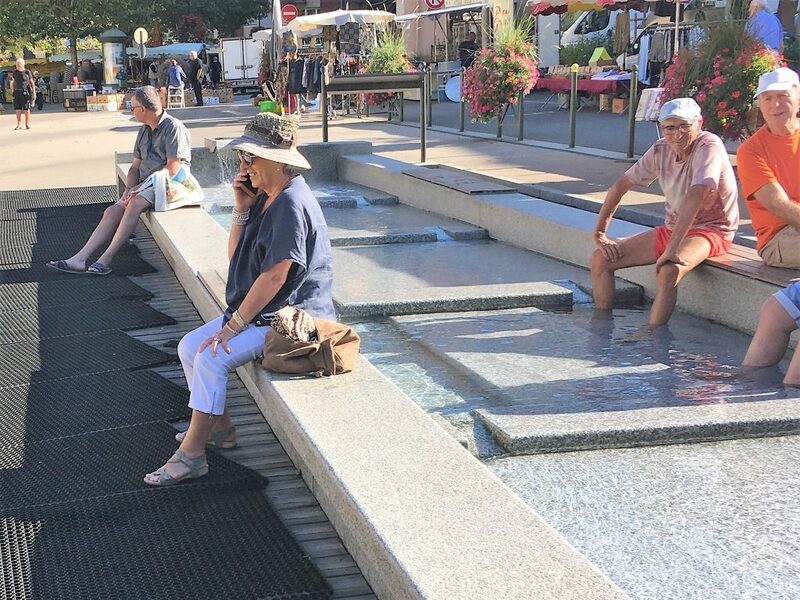 In the town square there is a small food market but the thing that attracts me the most is the thermal pool where people are soaking their feet in the thermal waters that give the town it’s name. From town we head out on a smallish road that takes us to the Orlu valley. Our research has given us two possible parking spots. The lower one near the Forges d’Orlu where there are a few tourist attractions and the higher one up at le Fanguil. The road to the higher area looks narrow and so we decide to park in the large lower area and cycle up to le Fanguil to see what it’s like. We cycle up the road to the higher parking area which is more open aspected. 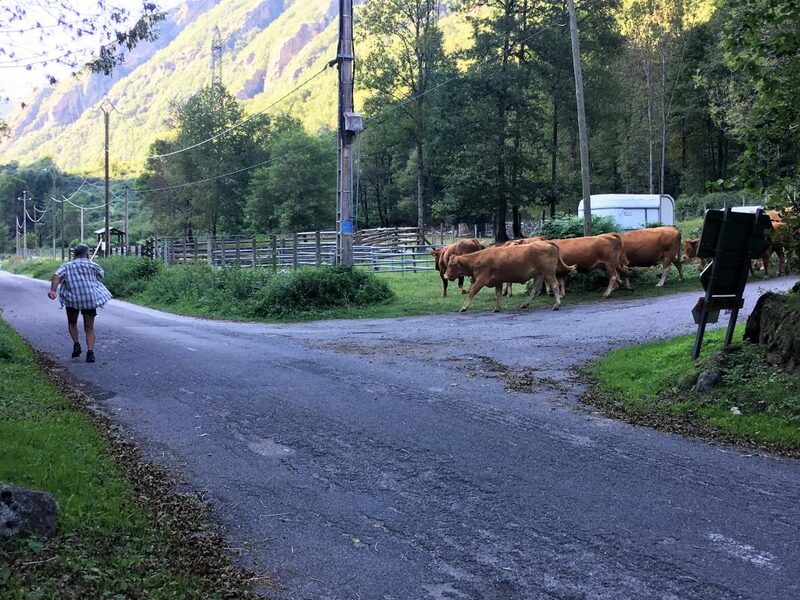 I would prefer to park here, but Paul is not happy to drive it; the herders are moving their sheep and cattle down the mountain and he doesn’t want to get in their way. As we’re not going to drive up we decide that we will cycle as far as we can up the valley. The ongoing path leads to a mountain refuge at the Etangs d’en Beys and starts as a wide track. 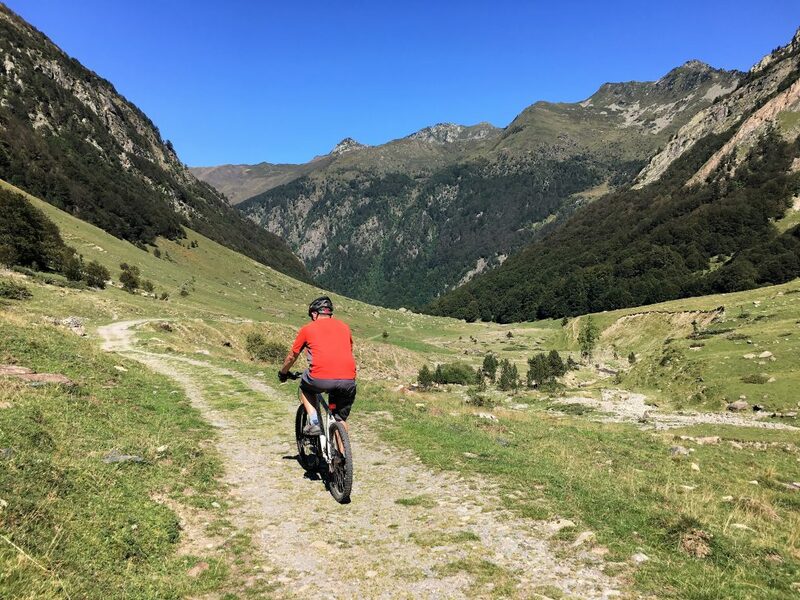 We cycle steadily up the track which is a bit rocky under our wheels but not too difficult. At one point we are over taken by a man on an electric bike and in turn we over take several walkers including a large group of teenagers on some sort of school outing. We don’t make it as far as the refuge but we do make it to the end of the track where the footpath branches off over the river. Here we rest and have a drink before we turn around and make our bone shaking descent. I realise that my uphill cycling muscles need some work as I am completely shattered by the time we get back. We stay the night in the lower carpark which has the benefit of a toilet block but no other motorhome services. We have a look around the small national park centre and admire the adventure playground where another, younger, school group are having a fab time. There is a wolf sanctuary here but it is not open, we don’t know if there are wolves in situ, but the next morning we hear howling and assume they must be, what a shame it was closed. 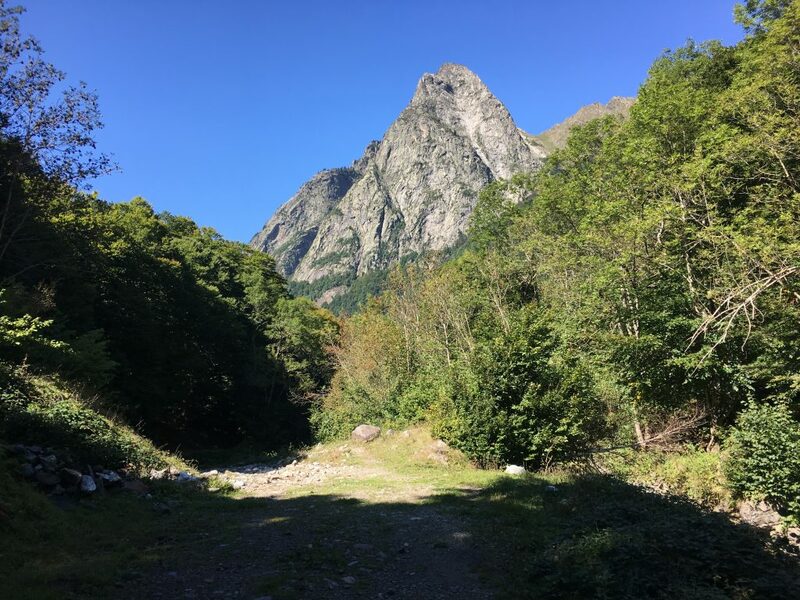 The following morning we take the walk up to the Etang de Naguille. It’s a steep walk through woodland at first following the stream up along damp and ferny paths. 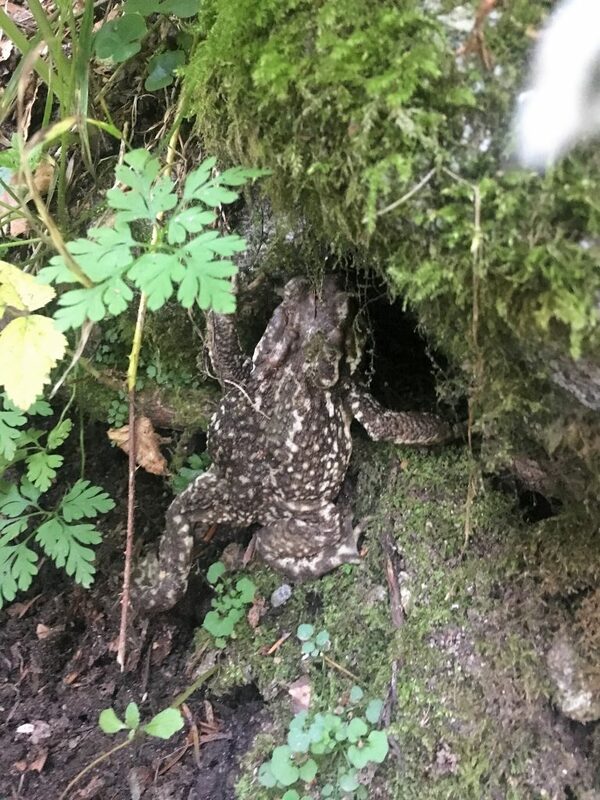 We see a lot of fungi and frogs, plus one large toad that hops lethargically out of the path in front of us. 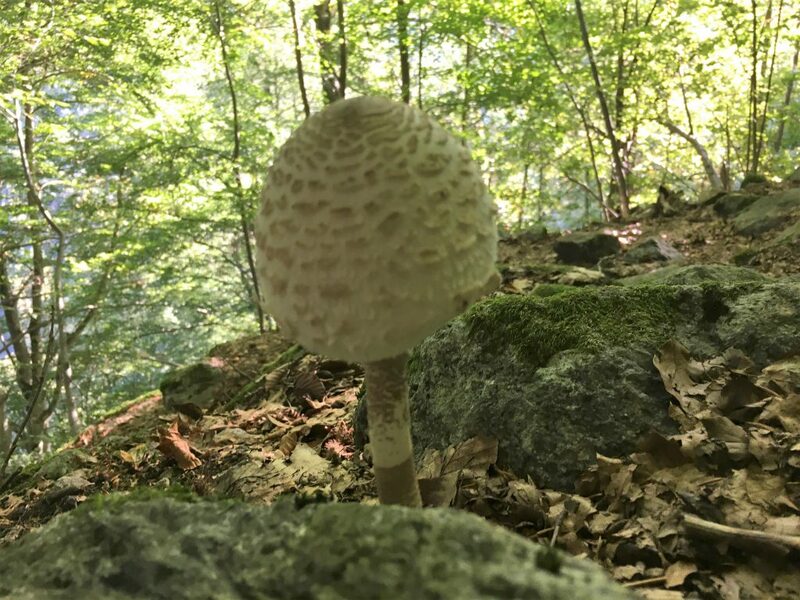 We slowly emerge from the woodland onto the open mountainside. 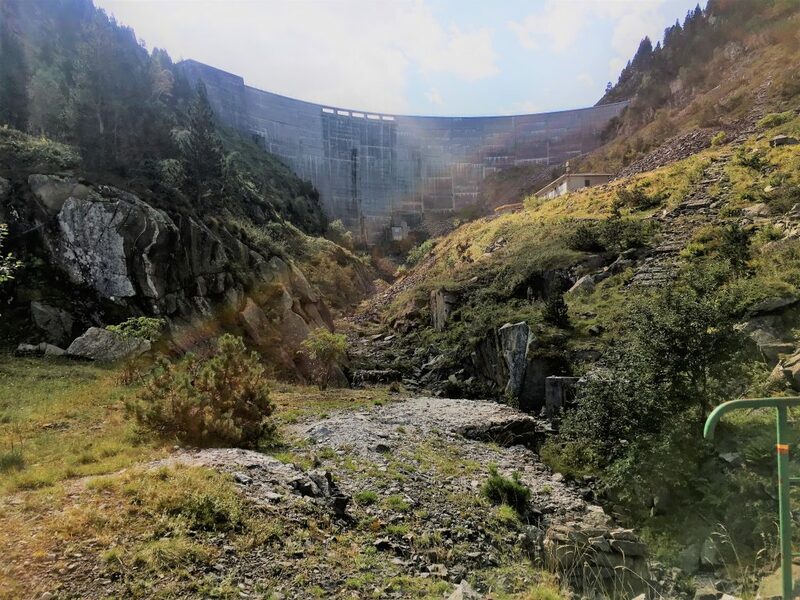 There is a large dam across the lake which feeds the EDF power station in the valley below and we have to climb up a broken concrete ramp to one side of the dam as the original path, which zig-zagged across this ramp, is closed. It’s a stiff old climb but once we are at the top we are rewarded with the view of the lake stretching in front of us, it’s calm waters reflecting the surrounding mountains. 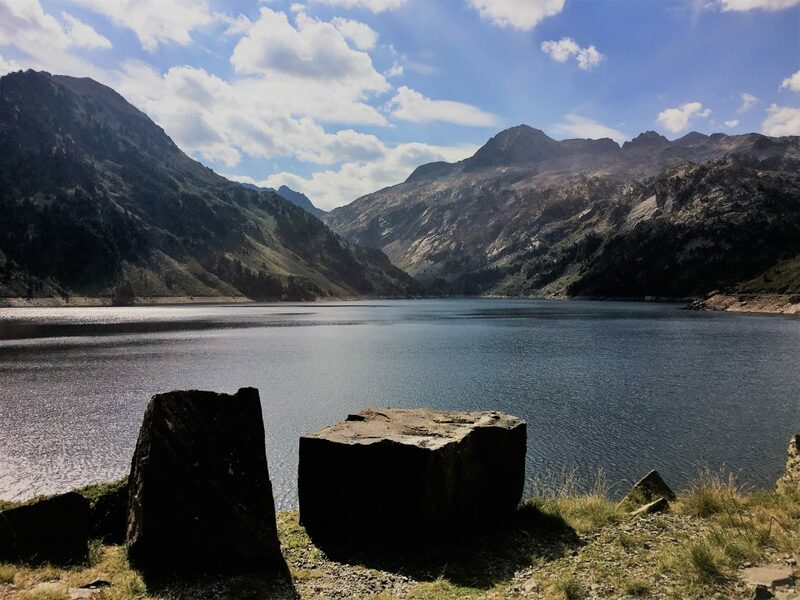 Although we had planned to climb higher to the next set of lakes we decide this is a fitting climax to our first mountain walk in the Pyrenees and we decide to turn back. We are exhausted and we can already tell that our legs will be tight and sore the following day. 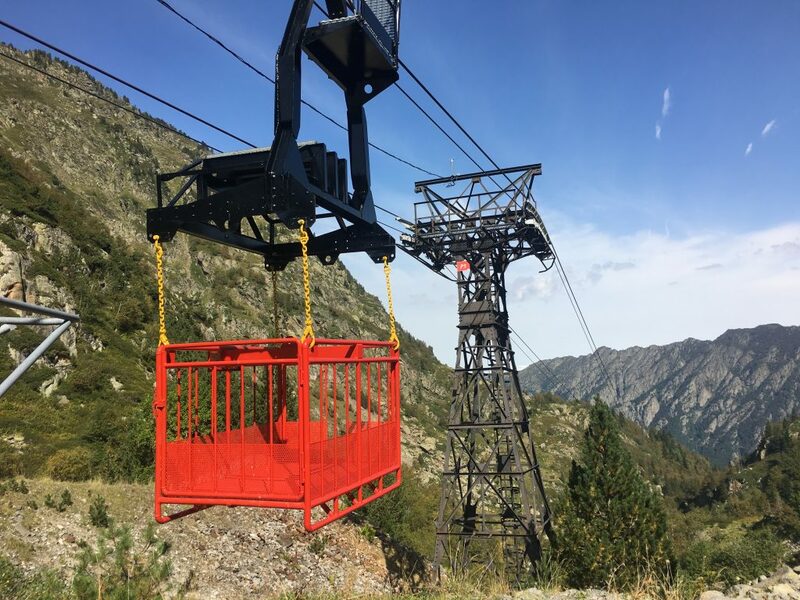 Cable car used for transporting equipment up to the dam. We drive back down to Ax-les-Thermes that afternoon. There are two aires in the town and one of them is next to the municipal swimming pool. We time our arrival before the swimming pool shuts which means that we can actually get in the aire and we can use the showers. It’s €5 euros for the night and the showers don’t look like much but they are hot and powerful. The women’s changing rooms are locked so I sneak into the men’s. Paul and I are in adjacent cubicles making sounds of pleasure as the hot water soothes our aching muscles. I just hope no one walks in as it probably sounds a bit dodgy.